Holy, Holy, Holy, Lord God Almighty, show us Your glory, Your holiness, Your face. Oh, Lord, You alone are Holy, Holy, Holy. I love Your holiness. I long to see you face to face. I long to reflect Your holiness. Oh, Lord, thank You for who You are. Your holiness is too majestic, too good, too lovely for me to understand, and yet, You draw me near. I love You, Lord. In Jesus’ name, Amen. For 52 years, King Uzziah ruled Israel, and the people loved him. “And as long as he [King Uzziah] sought the Lord, God made him to prosper” (II Chronicles 26:5). Who could fill the throne as well as King Uzziah? What would become of the nation? An empty throne. A failing Northern Kingdom. Confusion and despair. In a time of hopelessness, Isaiah sees the Lord of Hosts on the throne. Holy. Exalted. Worshipped. Isaiah’s response was different. When he saw the holiness of God, he realized his depravity. He was unable to remove his guilt and his sin, but when the altar’s burning coal touched his lips, he was cleansed. Then, the call to an authentic walk with God. And the Lord sent him to warn the people to turn from their sin. Most of us don’t have a dramatic encounter with God like Isaiah did. However, we have glimpses of God’s glory in each day’s sunrise and sunset, the unfolding of a rose, or the birth of a baby. We have a love letter from God, the Bible, that shows us God’s nature, and we have the Holy Spirit to teach us. God is at work in us, and we may recognize it in the small things: a prompting to pray for a friend – later, you find out that the friend was just diagnosed with cancer, a “yes” to a prayer, a door closed and a better opportunity opened. Authentic Christianity begins with the recognition of God’s holiness and our depravity. The altar’s burning coal, Jesus’s death on the cross, cleanses us. Jesus paid the price for our sin, and He conquered death by rising from the dead three days after His crucifixion. After the burning coal’s touch, Isaiah never said “Woe is me! I am unclean.” He went where God sent him, and he served the Lord and the Lord’s people. Remaining authentic is the key. Lord God Almighty, we are humbled that You would share glimpses of Your holiness and exalted nature with us. Great are You, Lord. Holy, Holy, Holy are You, Lord God Almighty. We praise You and give You honor. Bless Your people as we study Your Word and learn how to follow You authentically. Amen. Let’s study authenticity together in a series of posts. Do you know the Holy? Have you tried to grasp the wonder of the nature of God? And yet, the Word of God is given to us to learn of God, and the Holy Spirit dwells within God’s people to guide us and teach us. 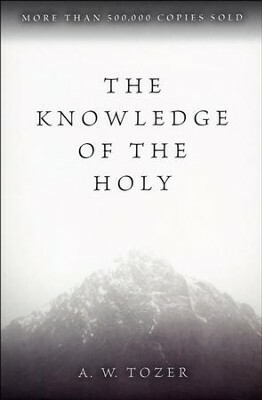 In The Knowledge of the Holy, A.W. Tozer prayerfully approaches the nature of God and reveals His majesty and glimpses of God’s height, width, and depth of nature. From the eternity of God to His omniscience, omnipotence, and omnipresence, to God’s faithfulness, goodness, justice, mercy, grace, and love, Tozer wraps God’s attributes in the absolute holiness of our sovereign God. This book was the last book Tozer wrote. It is evident that this book was the culmination of a lifetime of intimately walking with God. Although the book is only 117 pages long, I took my time and often reread paragraphs. A.W. Tozer has a special place in my heart, and this is a book that I will read periodically. I purchased it to read before I read the follow-up to The Knowledge of the Holy, Delighting in God. Father, thank You for revealing Your majesty to Your children. Help us to grow in understanding and awe as we walk with You. Reveal Your holiness to us, and lead us by the right hand as we grow more intimate with You. I am awestruck by You, and I want to know Your ways, Your thoughts, Your nature more deeply. Blessing and glory and wisdom and thanksgiving and honor and power and might, be to our God forever and ever. Amen! This week, take a few minutes every day to think about God’s holiness. Share what the Holy Spirit reveals to you in the comments below. I can’t wait to read what He will teach you.